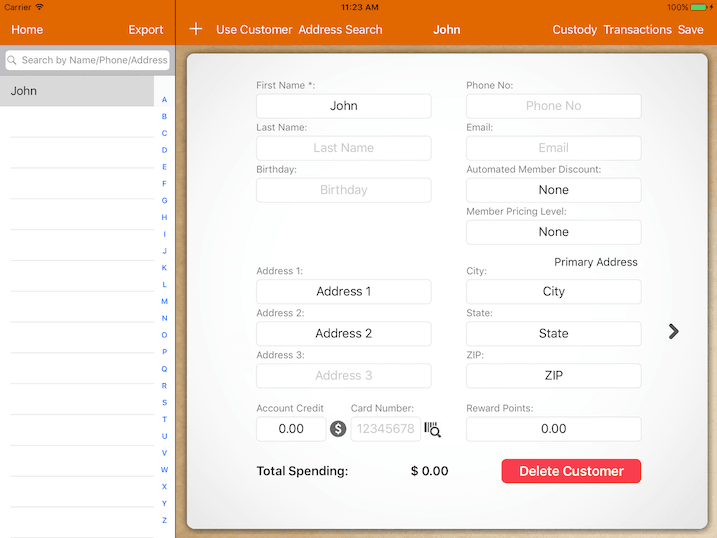 Fill up necessary details to add a customer. Add multiple address for customer by clicking the right arrow. Assign customer to receipt so you could track customer spending, give rewards or use account balance to close a bill. Apply bill discount automatically when member is assigned to bill. To have a different set of pricing specifically for different tier of customer. For more information, please refer to Pricing Level. If customer decided to pay with their account credit, balance will be deducted. Click on the dollar sign button beside the credit balance to view customer top up records. With sufficient permission, you could modify the credit balance without topping up. When making a sale, you could charge to the customer's credit account. Assign the customer to the receipt, click on Pay in cash register, you will see Charge Customer button. States the reward points balance. Setup Rewards/Loyalty to reward customer. Type in the streets name to lookup customer address easily. Address search requires internet connection. View all customer's past transaction. It will include unpaid transaction as well.